Rochester Jamaican Organization Celebrates Jamaica’s 50th Year of Independence! U.S. Congresswoman NY (D) Hon. 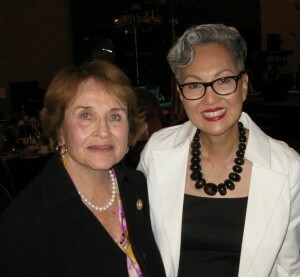 Louise Slaughter and Mary Ho, President of the China Millennium Council enjoyed the spectacular extravaganza celebrating Jamaica’s 50th Year of Independence at the annual Rochester Jamaican Organization Gala held at the Grand Hyatt Regency Hotel. Honored for her pioneering humanitarian and entrepreneurship, Gloria Langston, owner of WDKX Radio, the first national African-American Radio broadcasting station celebrated Jamaica’s grand cultural history. Ms. Langston is founder of the Andrew Langston Center for Educational Excellence & the WDKX Minority Internship Program, providing student leadership training to advance education and broadcasting careers. Honored guests featured Jamaica native Garth Fagan, Tony Award Winning Choreographer of Lion King, City of Rochester Mayor Thomas Richards, Monroe County Executive Maggie Brooks and U.S. Consul General of Jamaica, Honorable Herman G. LaMont. This entry was posted in AAPI, Asian American, China, Diversity, India, Japan, Leadership, South Korea, Southeast Asia, Thailand, Vietnam and tagged AAPI, Asian American, China, India, Jamaica, Japan, Korea, Louise Slaughter, Southeast Asia by . Bookmark the permalink.